Deswik announces the launch of Deswik.OPS, their new operational shift planning and tracking tool. Directly integrating with a variety of systems that maintain longer term schedules, planned KPIs and production data, this new tool is set to revolutionize the way mines manage their daily operations. 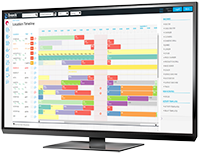 Deswik.OPS enables production planners to rapidly create detailed, activity-based shift plans directly from the less detailed shorter-term schedules. Longer term schedules can also be imported to ensure the shift schedule remains on track with the organization’s longer term goals. Throughout a shift, users can import from third-party systems or manually capture real-time production data and events, mapping them to the activities and resources. By providing a live view of how the shift plan is progressing, the work can be better managed, resulting in higher productivity. In order to deal with the continual change in an operational environment, dynamic updates to the shift schedule are also possible. Designed to meet the daily requirements of short-term engineers, production engineers, shift bosses, control room personnel and site superintendents, this new web-based tool will provide a centralized, collaborative interface and have everyone working towards common goals. Deswik.OPS has been implemented at two beta sites, one in Northern Europe and another in Western Australia. Deswik engineers have been working closely with the clients to ensure that the system was not only set up to meet their specific requirements, but also tested extensively in an operational environment. Deswik.OPS will be unveiled at MinExpo International 2016 in Las Vegas next week. Visitors to the Deswik booth will have the opportunity to interact with the tool and learn how they can use it to execute their mine plans more efficiently.